I.H.A. (I hate acronyms). They S.U.C.K. (Super uncreative corporate kaka)! Acronyms, the friend of FDR, the New Deal, and Washington, DC, obliterate meaning. If you are a new or even an old company, the last thing you want to do is to create a three-letter name. No one can remember the letters, especially in the DC area. Even worse, acronyms are almost completely unbrandable. 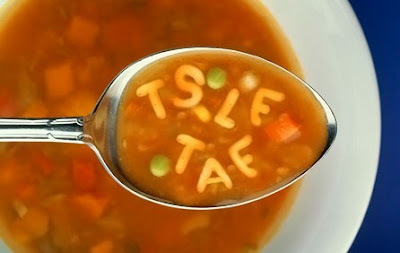 Unless you are IBM, CNN, or AT&T, forget about turning to your bowl of alphabet soup for a name change. The Feds claimed this territory a long time ago; commercial enterprises don't stand a chance. NEW YORK (Hollywood Reporter) - At the end of what will be a record year for viewership, Headline News is getting a name change. The 26-year-old news channel will be known as HLN. It follows in the footsteps of such other Turner Broadcasting networks as TBS, TNT and, of course, CNN. Along with the new moniker, the channel is getting a new logo and slogan: "News and Views." CNN Worldwide executive vp Ken Jautz said Wednesday that the channel is acknowledging that it has evolved beyond the headlines-every-hour format that marked its first two decades or so. Since 2005, Headline News has been, at least in primetime, more like cable channels MSNBC and Fox News Channel in programing talk shows. Nancy Grace has had her own 8 p.m. program for the past three years, and Glenn Beck held the 7 p.m. slot for two years before he left for Fox News Channel. "We feel (the tagline and name change) is more representative of what the channel has become in primetime," Jautz said. First off, I question the rationale of changing the name at all. If the network soared by 15 percent last year, why fix something that ain't broken? The execs see the network name through their own eyes and not their viewers and it's a huge mistake. Yes, we all know we can turn on Headline News during the day and get the latest news in a half-hour segment. But that doesn't mean that the name becomes nonsensical when execs schedule Nancy Grace at night. As a matter of fact, if you're into sensationalized, up-to-the-minute news about the world's latest scandal, Nancy Grace provides genuine (if rather seedy) headline news. Second, having all Turner properties adopt acronyms offers another example of H.L.T.F.M. I possess vague recollections of Cable News Network and Turner Broadcasting System, so I know what CNN and TBS represent. But that collective social memory evaporates as younger people watch these networks. Ted Turner is an innovator. I can't for the life of me understand why he'd make all his channels sounds like CBS, ABC, NBC, and PBS. Third, taglines should elucidate for consumers the unique attributes your product or service delivers. "News and views" could be the tagline for CNN, NBC, CBS, ABC, PBS, MSNBC, CNBC, and the like. This generic tagline is useless, meaningless, and BAD. Fourth, look at that new HLN logo and tell me that you don't immediately think HSN - Home Shopping Network. I want to whip out my credit card and go buy something dumb on television! The only thing I like about the logo is the voice bubble. The rest S.U.C.K.S. Don't name your damn company with a damn acronym. If you are a sole proprietor, don't name your company with your initials. Remember, your company isn't about you, it's about your customers. Don't ever forget it! If you have a real company name, use it. Don't turn The Washington Post into WP, for example. Use the most important or distinguishing word in your name as the corporate moniker instead. Thus, most Washingtonians call our city's paper the Post. Remember, people will remember your name - but never your acronym. Pick a meaningful, useful tagline. Hire Julie & Company to help you with naming issues. Just like everything else in branding, it looks easy but it's not. It's tough work and belongs in the hands of experts. Truly. Headline News would never have been renamed HLN if its execs had hired Julie & Company - even if it meant we didn't make much money! To conclude: HLN is SOL. And that's the truth!